DUBAI, 9th June, 2017 (WAM) -- The Dubai Roads and Transport Authority, RTA, has started colouring the asphalt red on parts of streets that are subject to changes in speed limits, such as Oud Metha Street near Bu Kadrah Interchange along the extension of Dubai-Al Ain Street, where the maximum speed limit has been reduced from 100 to 80 kilometres per hour, kph Maitha bin Adai, CEO of the RTA’s Traffic and Roads Agency, said, "The experiment was carried out at a certain location on Oud Metha Street, near Bu Kadrah Interchange along the Dubai-Al Ain Street. The process involved colouring all lanes in an eye-catching style to alert road users of the new speed limit. 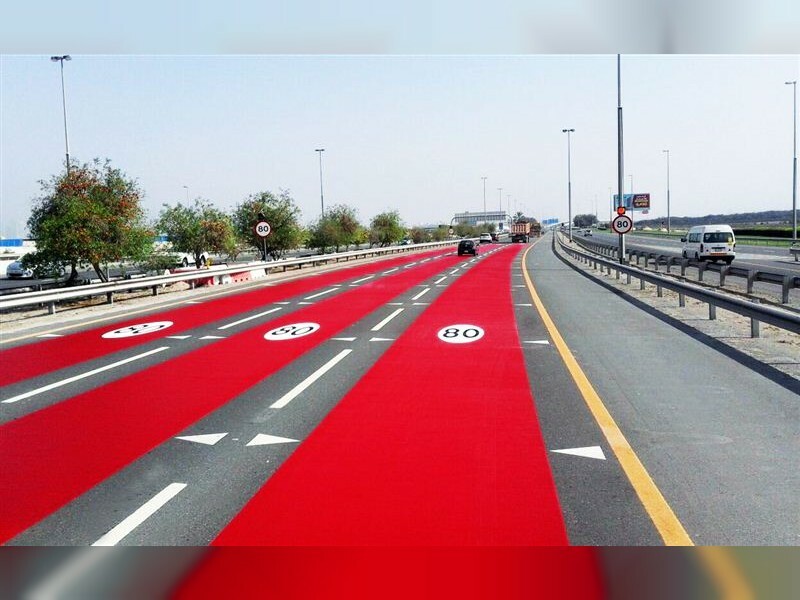 Asphalt colouring will also be used in phases at locations subject to speed changes on other vital roads in Dubai. Therefore, we expect motorists to get used to this for their own safety and avoid offences and accidents resulting from speeding, as per the RTA’s vision of a "Safe and Smooth Transport for All." "It is stressed that this location is experimental, and the idea will next be implemented on Sheikh Zayed Road near the fifth interchange where the speed limit has been reduced from 120 kph to 100 kph. It will also be applied to the Jebel Ali-Lehbab Road near Lehbab, where the speed limit has been reduced from 120 kph to 100 kph, so that motorists can avoid speeding and radar tickets. The experiment will be evaluated to verify its impact on drivers’ attitudes. It is expected that the procedure will significantly increase compliance with specified speeds and avoid potential accidents," added Maitha bin Adai. "The various development projects launched and implemented by the RTA since its inception have contributed effectively to decreasing the number of traffic accident deaths by as much as 50 percent. Traffic fatalities came down from 332 in 2006 to 166 in 2015, and mortality rates went down from 21.7 deaths per 100,000 people in 2006 to 3.5 per 100,000 people in 2016. These statistics have placed Dubai among the top five cities in the world in terms of traffic safety," she explained. "According to the three key elements of the RTA’s traffic safety plans, which are drivers, vehicles and roads, systematic engineering measures are being taken to improve the level of traffic safety, including changing the speed limits of roads with elevated traffic volumes or a change in actual speeds in a manner that warrants re-assessment. Excessive speeding causes 80 percent of severe traffic accidents. Associated factors were examined as well. A study was commissioned to improve the locations witnessing speed reduction to alert drivers to be more attentive and have them reduce their speed to match the design of the road and avoid being caught by radars," she added. "Based on engineering specifications stated in the Traffic Control Devices Manual, a proposal was developed for colouring the asphalt red, at a sufficient distance for motorists to gradually reduce their speed without obliging them to suddenly apply their brakes. We anticipate that this course of action will contribute to lowering the number of future accidents. Similar previous actions have contributed to reducing the number of traffic deaths on key streets and highways, which are witnessing the largest number of traffic accidents in the emirate. Accordingly, the number of traffic fatalities on Sheikh Zayed Road has plunged from 17 in 2015 to just 10 deaths in 2016, and the number of traffic fatalities on the Dubai-Al Ain Road fell from 10 in 2015 to just eight in 2016," she noted.